Delhi-based Centre for Policy Research (CPR)-Namati Environmental Justice Programme, involved in the analysis of the draft Coastal Regulation Zone (CRZ) notification, 2018, has found that a great majority (68%) of representations on the draft sent to the Ministry of Environment, Forests and Climate Change do not want the Government of India to finalize it in its present form, even raising serious objections to it. Stiff opposition to the draft, CPR-Namati researchers say, particularly comes from local coastal communities, including fisherfolk and self-governing bodies. However, they add, industry –sectors such as tourism, real estate and construction, mining, ports and harbours – seek the draft to further dilute norms “developmental” activities along the coasts. Ministry of Environment, Forests & Climate Change (MoEFCC) issued the draft Coastal Regulation Zone (CRZ) Notification, 2018 on April 18, 2018. The draft came after yearlong indications that the current CRZ Notification, 2011 will be replaced by a new Marine Coastal Regulation Zone (MCRZ) Notification. The proposed changes to the CRZ regulation drastically alter the original provisions of the notification. The draft was open for public comments till June 17, 2018. During this time the ministry received 471 submissions on the draft. Several of these submissions had multiple representations/ signatures in them. 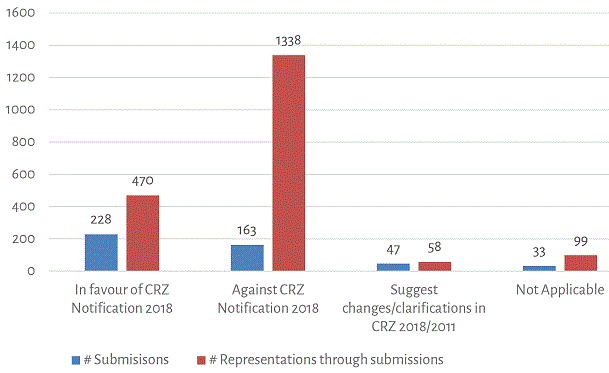 If the number of representations is factored into the comments received on the draft CRZ Notification, 2018, the total number of responses received becomes 1965. Researchers from the CPR-Namati Environmental Justice Program have analysed these comments to understand that most submissions raise serious objections to the ministry’s proposal. On analysing these responses all together, it was found that of these 1965 responses, 1338 (68%) responses have objected to the finalisation of the draft CRZ Notification 2018. About 23% responses have been in favour of the draft CRZ Notification 2018. Small percentages of responses have suggested changes or sought clarifications to the CRZ Notification and some are inapplicable due to the responses being in regional languages or concerning issues other than coastal regulation. More than half (250) of the submissions are from coastal citizens. In these 250 submissions there were 414 additional representations/signatures. So total number of responses from coastal citizens becomes 664. Of these 54% (362) demand that the draft CRZ Notification 2018 should not be pursued by the ministry. 32% (216) are in favour of the draft CRZ Notification 2018. Of the 216 responses that are in favour of the changes, 207 have even asked for further opening up of the coast for tourism projects, dwellings for locals and commercial constructions among others. Many of these responses are from Goa, Kerala and Maharashtra. While most respondents have only mentioned their names and addresses, a small number have identified themselves as advocates and doctors. 5-7 submissions from Sindhudurg and Malvan in Maharashtra seek clarification on the critically vulnerable area protection for these regions as required by the CRZ Notification 2011. This is especially so because no such special provisions are provided in the 2018 draft. The local bodies that have sent in their responses are from the states of Goa, Maharashtra, Diu, Karnataka, Kerala and Gujarat. 17 submissions have been received from local institutions that include Gram Panchayats, District Panchayats and Municipalities. Of these 13 have suggested changes in the draft CRZ Notification 2018. Many of these include the suggestion that instead of the proposed No Development Zone (NDZ) of 50 m for thickly populated areas and an NDZ of 200 for thinly populated rural areas, a uniform NDZ of 50 should be applied. In the current CRZ Notification 2011, a uniform NDZ of 200 m has been provided. Some panchayats have demanded that their villages be turned into urban areas. One has demanded retention of provisions of the current CRZ Notification 2011. Four submissions from local bodies could not be considered as the ministry noted that they were in regional language. 45 responses have been from the sectors of tourism, real estate and construction, mining, ports and harbours and industries. Of these 40 have suggested further dilutions in the draft and two have appreciated the draft. Some of the suggested dilutions are permitting mechanised mining, fish processing plants and storage of chemicals that are allowed to be transported through pipelines and jetties in the CRZ, lifting restriction on land use change for buildings in the CRZ. Remaining three responses have either sought clarifications or sought retention of certain biodiversity protections in the notification. Of 28 fisher groups who have sent in their submissions, 24 have expressed their objections to the draft CRZ Notification 2018. They either ask for the draft to be scrapped or demand continuation of the current provisions. One such submission from Pavity Jinwar Kodi from Mumbai has 120 representations. The submission states that the CRZ Notification 2011 is better than the draft. It demands that the fishers be given importance and no draft should be considered without consulting the fishing community. These 24 submissions also have 181 additional representations/signatures. Several submissions suggest that the NDZ in rural areas and around the creeks should not be reduced. 3-4 fisher groups have demanded that CRZ Notification should be turned into an Act. Ten government departments from the state of Maharashtra, one from Kerala, one from Karnataka and two central government departments have also submitted their comments. Of these two didn’t have any specific comments, 11 have sought more dilutions in the draft CRZ Notification 2018. This is with respect to their jurisdictions such as Maharashtra Metro Rail, Urban Development and Mining, Karnataka Tourism, and Coast Guard headquarter. They suggest changes pertaining to approval of buildings according to the local town and country planning norms, metro and allied activities, Indian coastguard stations and associated infrastructure in the CRZ, further reduction of the NDZ and no requirement for maintaining buffer around mangroves on private lands. The ministry received six submissions from politicians and political parties. Four are from Daman & Diu offices of Bhartiya Janata Party (BJP), one from a member of parliament from the BJP and one from the Aam Aadmi Party (AAP), Goa. All of them, except AAP have requested for additional easing of the CRZ regulation. These suggested changes relate to further reduction of the NDZ, conversion of rural areas (CRZ III) to urban areas (CRZ II) so they have fewer restrictions for land use change. One submission suggests that mining of all minerals be permitted in water areas of the CRZ. Besides these, submissions have also been received from academics, researchers, scientific and educational institutions and religions institutions. Changes to the CRZ Notification have been under discussion for past four years – a special review by the Shailesh Nayak Committee followed by a series of amendments have been in the news (click HERE, HERE and HERE). 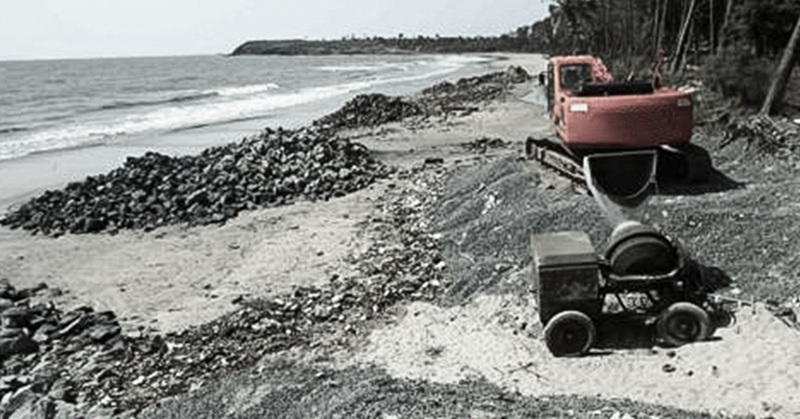 All these efforts of the ministry at altering India’s coastal regulation have been characterised by opacity, including a closed-door review, and denied opportunities for public comments on amendments. But, such large number of responses on the draft CRZ Notification, 2018 is a reiteration of the fact that coastal regulation is an issue of citizen and public interest. The above analysis of the comments shows that there is a diversity of viewpoints on the draft. The draft is yet to be finalized, and as of October 2018, the MoEFCC had compiled these diverse comments for consideration. While finalising, the ministry is also going to strive to resolve the issues on which a difference of opinion was observed among its officers and ministers and weave those changes in. The lack of consensus within and outside of the ministry is a clear indication that the contentious points of coastal regulation need public engagement larger than what is being practiced currently.